Regrettably we have been forced to suspend deliveries for the time being due to shortage of vegetables! This is mainly caused by the exceptionally hot summer last year which resulted in a significant number of crop failures and also restricted our ability to transplant so that the crops from many of our brassicas have been much lighter than usual. At the moment we’re not able to give a start date, likely to be mid June, but the good news is that the asparagus is just about arriving! We’ll also be open for sales at the Farm Gate (7 Green Lane DT6 4ED) as usual on Friday mornings until noon when we’ll have a good selection of our remaining produce, parsnips, beetroot, spinach, kales, leeks, squash and chard available, in addition to the asparagus. 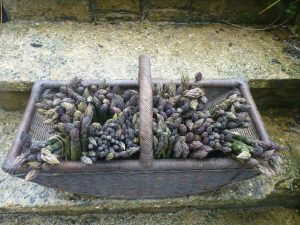 If you can’t get to us and want to place an order to be collected on Friday afternoon or Saturday morning please get in touch; in addition we’ll have our asparagus at Bridport Street Market (junction of East and West Street, outside Steptoes) on Saturday mornings and will also have it here with an honesty box. We look forward to seeing you on a Friday morning and will return with new season’s produce just as soon as we can!